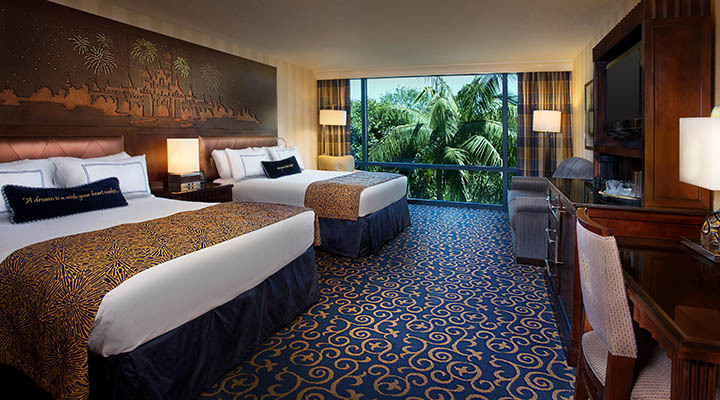 Full of classic Disney magic, themed rooms, exclusive amenities, fun pools and more. 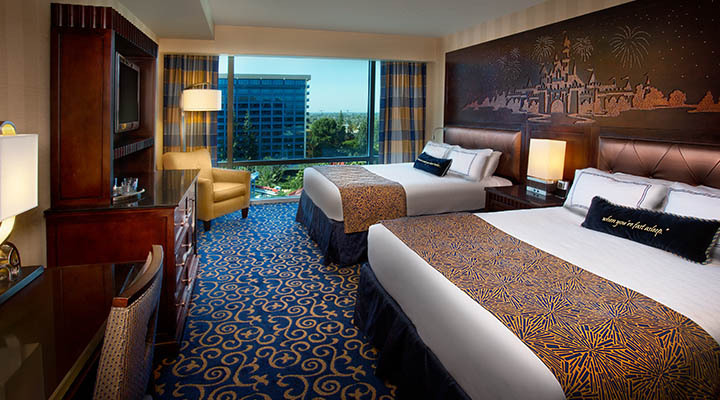 Bring the magic of the DISNEYLAND® Resort back with you at the end of each day in the completely renovated DISNEYLAND® Hotel! 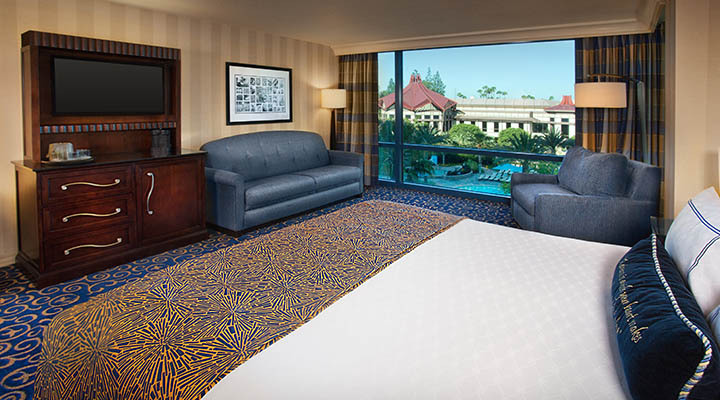 Comfortable rooms with classic Disney touches, gorgeous grounds and tantalizing restaurants add to the excitement of your stay. 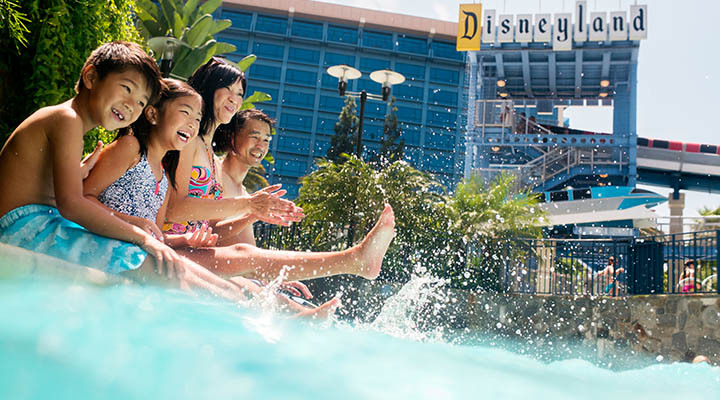 Make a splash at either the E-ticket and D-ticket pool, or test the Monorail Water Slides. 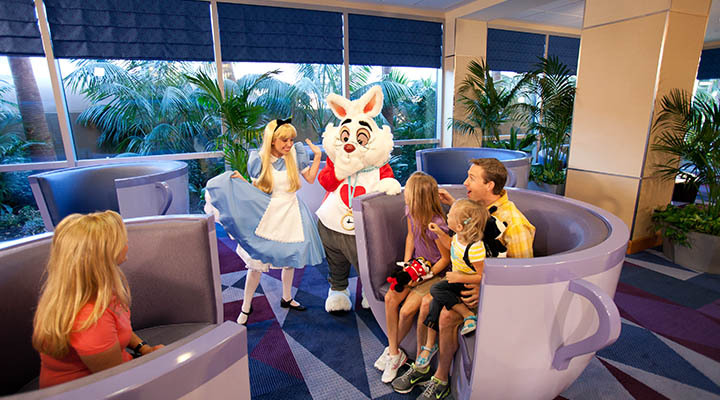 Be sure to set up your special Character wake-up calls and make reservations for the on-site Goofy’s Kitchen where you can dine and rub shoulders with your favorite Disney characters. This classic hotel is a Disney vacation dream come true! Great staff, great rooms and clean! Love the headboards they light up! My favorite part of the rooms at the Disneyland Hotel is the bed headboards. They light up in the shape of Cinderella’s Castle; “When You Wish Upon a Star” plays. It’s magical for younger children. The beds are really comfortable; I sleep better here than at home. Good location; all you have to do is walk across the street and you’re in Downtown Disney, where you can hop on the monorail. It’s worth the money to stay here. 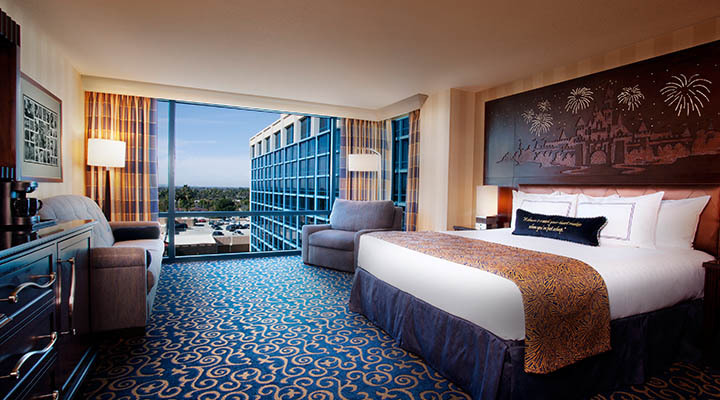 We had stayed at the Disney hotel in the Fantasy Tower twice in the past and loved our rooms. This time we were not told when our room was ready. When we left the park and went back because we were concerned about not having heard, we found out a room was ready at a different tower. When we got over there, our keys would not work. I called the front desk and they said our lock was apparently broken and they would send someone to fix it within half an hour. We were left standing for 35 minutes when I called again and apparently the person I spoke to the first time did not report the problem. I was tired and angry and told the lady such. Some person who works at the hotel came in and my husband asked if he was maintenance. He was not so we told him our problem. Finally a manager came over and we told him what was happening and that we were upset. He went and got 2 new keys and said it was not the lock after all. Very frustrating. We asked for a King room and got 2 queen size beds instead. I am 70 years old and have some lung problems and this extra distance took a toll on me physically when walking to the parks, etc. Very disappointing this trip. 4 Stars- We loved it! We stayed in a premium veiw room. The room was comfortable and the magic headboard was amazing. Mouse keeping did a great job keeping the room clean and fresh every day and even put our daughters stuffed animal on the bed as nice touch. Steakhouse 55 was great. The hotel staff is friendly and super helpful. Weven will stay here again and again. This hotel is amazing makes you feel like your at home and everyone is family. It's literally only a 7 min walk to disneyland and California adventures and downtown Disney is just right there. You will not regret staying here love love love this hotel!!! 3 for value but amazing experience!! I am giving this hotel a 3 for value.....this should come as no surprise as you pay for the brand. Here are my complaints, we'll get them out of the way....Food prices are through the roof. There are tea packets in your room and instant coffee but thats all the complimentary anything you will receive. If you want coffee you must purchase it. There is a cafe in the main lobby, accessible easily, expect to pay starbucks prices, coffee is good. There is a bar located poolside and poolside service, I didn't pay less than 8$ for a drink, completely expected it. There is absolutely no complimentary breakfast so don't expect it. The next issue with this hotel is the location. 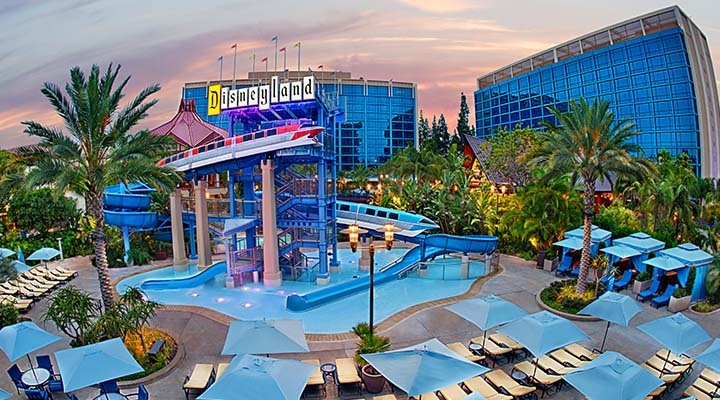 The monorail is right outside the hotel and will take you straight into Tomorrowland but if your destination isn't Disneyland be prepared to walk through downtown Disney which is an outdoor mall, open to the public, about a mile long. The walk took my husband, me, two teens, and a 6 year old 9-12 minutes depending on our mood and traffic. It's approximately 1 mile from the downtown Disney entrance to the main entrance of Disney land. In my book, not that big of deal. We still had the monorail and DD was fun to stroll through and grab expensive churros. Some may not be able to make the walk. Now for all the fun stuff. The staff was OVERWHELMINGLY wonderful! We traveled 10 hours all night to get there and ended up getting in at 5am. We didn't expect such an early arrival. Check in isn't until 4pm. They took our bags to hold and since we were staying at the hotel we were able to enjoy "Magic Mornings". This meant that guests of the hotel get to enter the park one hour prior to the park opening (you'll get right on the rides!). We waiting about an hour once everything was said and done and then park opened for us at 8. Our rooms were actually ready for us a little after noon. They allowed us an early check in, no problem, no fees. They were kind and happy to do it. Such wonderful service I was so relieved. The room was spectacular. There were 5 of us, 2 teen girls and 1 year old boy, my husband and I. We always get 1 room, 2 queen size beds. The 3 kids have always shared but they offer a pull out bed/couch bed. We were nervous as we haven't stayed in a hotel for a couple years and the kids were all smaller then. We all fit in the room so comfortably. I am so happy that I didn't get a second room. Considering the time we actually spent in the room, and the space we had to sleep, relax, shower, get ready, and throw our stuff around, there was no need for it. If we had another 6 year old kid with us honestly, they would have fit on that couch bed with our son. It was very well equipped to handle our family. Everything was perfectly clean and bright and fresh in our room and our second evening housekeeping came around to ask if we needed anything (they may have come night 1 and 3 but we were out partying and DLAND!). I was unsure about staying in this hotel and spending all this money on a brand name just to be disappointed but went ahead and did it because I am the only member of my family who has ever been to disneyland and we always low budgeted it as a kid and wanted to make this super special for everyone and I am so pleased that I did. So pleased that I would go as far to say that I would stay there again. I may not go all out and allow myself an unlimited bar and food tab, i wopuld prep a little better there and probably bring my own tea packets or a french press but my oh my.....we loved being here. 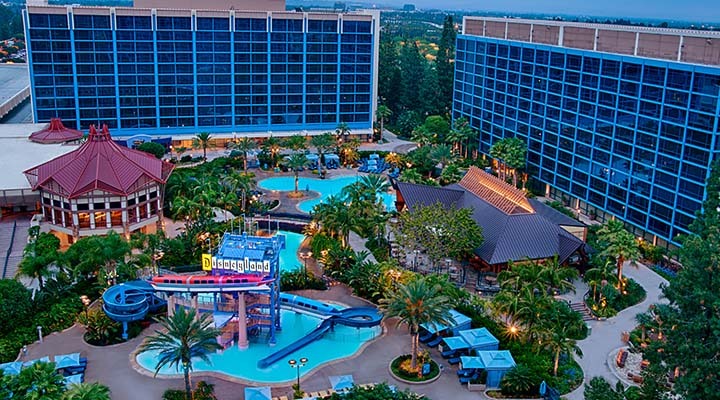 We stayed at the Disneyland Hotel with two kids, and they thought it was incredible. They loved the Monorail slide, and my wife and I enjoyed the hot tub and fire pit. The beds were great, and my daughter kept starting and restarting the light-up musical headboard. We did Goofy's Kitchen on our last day before leaving, which I thought was fine, but the kids loved it. We would stay here again with young kids, but as they get older, we'd probably rather stay at the Grand.